It was heartbreaking to see the way elderly Fr. Norman Weslin was treated and arrested. "In the year 1241, the Baron de Grey of England was returning from the Crusades in Palestine: he brought back with him a group of religious from the holy mountain of Carmel. Upon arrival, the baron generously presented the monks with a manor house in the town of Aylesford. Ten years later, in that very place,there occurred the now-famous apparition of Our Lady to Saint Simon Stock. As the Holy Virgin handed Saint Simon the brown woolen Scapular, she spoke these words: This shall be the privilege for you and all Carmelites, that anyone dying in this habit shall not suffer eternal fire. 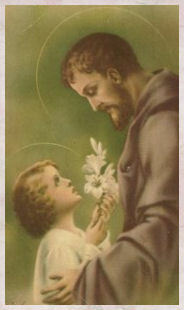 In time, the Church extended this magnificent privilege to all the laity who are willing to be invested in the Brown Scapular of the Carmelites, and who perpetually wear it..."
The Rosary - There is No Repetition in "I Love You"
The Beautiful Truth is there is no Repetition in "I love you"
Because there is a new moment of time, the words do not mean the same as before. Love is never monotonous. The mind is infinitely variable in its language, but the heart is not. The heart of man in the face of the woman he loves is too poor to translate the infinity of his affection into different words. So the heart takes but one expression "I love you." and saying it over and over again, it never repeats. It is the only real news in the universe. That is what we do when we say the Rosary. 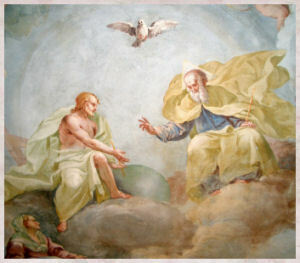 We are saying to the Holy Trinity, to the Incarnate Savior, to the Blessed Mother, "I love you." "I love you." "I love you." Having reflected on this beautiful prayer, Our Lady gave us , we can see why St. Padre Pio often said, "It is Our Lady who gave us the rosary, but the devil is always trying to take it away from us! Don't ever let him do it? 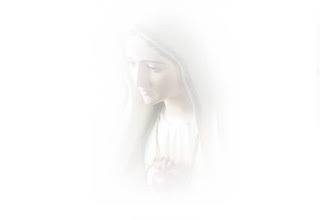 World Apostolate of Fatima Spiritual Guide for the Salvation of Souls and World Peace. If you recall, I recently posted an article regarding Dr. Alice von Hildebrand's criticism of Mr. West's approach to JPII's Theology of the Body. I did state that I was unfamiliar with his work but that I had high respect to Dr. von Hildebrand. Since then I have had a chance to listen and watch Mr. West online and what he has to say to married couples on the subject of the TOB. Although, what I listened to was not in depth and or as complete as attending one of the West TOB conferences would be, I did get a good idea what Christopher West is teaching. I thought what he had to say was very helpful and not at all as controversial as ABC Nightline portrayed it. As I also mentioned many fellow Catholics I respect highly recommended his talks and this made it important to me to find out for myself. I guess the only way to find out what Mr. West has to say is to listen to him for yourself and then make an educated decision for yourself. I only wish I were in Hawaii for his upcoming talk. There is an article someone shared on Twitter that I thought you may want to read. I wanted to share this very powerful story with you. 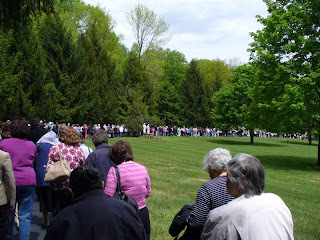 My mom, aunt, sister and I joined several hundreds of fellow Catholics in spending the day with our Lady of Fatima at the Blue Army Shrine in Washington, New Jersey. What a glorious day it was! New Jersey has been having chilly, windy and rainy weather. 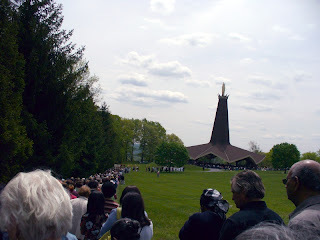 But on May 13th, it was a beautiful day for Our Lady's Feast Day. Upon arrival and a quick lunch, we headed off to Confession. There were many stations for Confessions in English, Spanish, French and Italian. 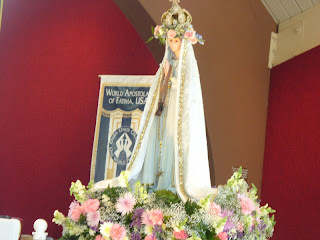 Those who were ready joined in the procession of Our Lady of Fatima while we prayed the 5 Glorious Mysteries. 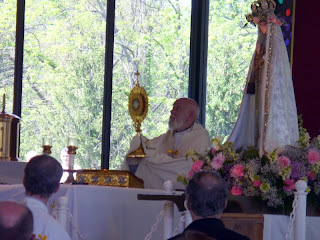 In the second picture below you can see the huge statue of Our Lady of Fatima atop the main chapel. The Mass began after a few speakers. It was beautifully and reverently celebrated by Fr. 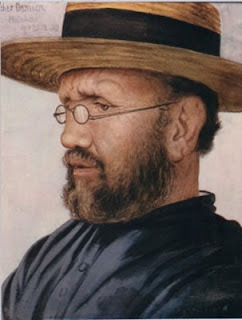 Clement J. Machado, who has appeared on EWTN and concelebrated by many other priests. One priest was from Fr. Benedict Groeschel's order, the Franciscan Friars of the Renewal. That is Father Lawrence below during Holy Communion. He was celebrating a year anniversary from the first time he celebrated Mass. Benediction followed the celebration of the Holy Mass. The picture below is of Fr. 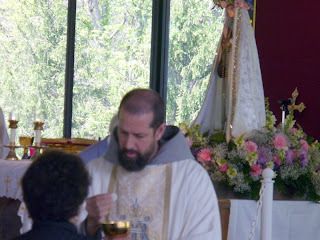 Paul Ruge, the chaplain of the Blue Army Shrine holding the Monstrance during the Benediction. The sad part of the day was when our Lady's statue left the Chapel. 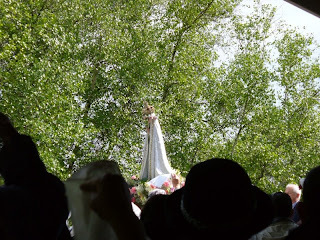 We sang her a lovely hymn Farewell Fatima and waved our white hankies as we bid our Lady adieu. to save you are most ready. as we leave, O Mother dear! Vs 1: Jeremiah Cummings 1814-1866 alt. Vss. 2-3 Anon. It was as stated in verse three, a teary time for us. As you can see my mom and the majority of the people there worn blue in honor of our Lady. 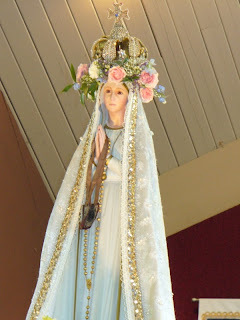 There will be many more posting on the message of Fatima through the World Apostolate of Fatima. If any of you are interested in joining the WAF, please visit their website. Those in Hawaii interested in joining, please contact me directly by email, comment or phone. Dearest Mother, Queen of the Holy Rosary, who came to Fatima to reveal to all mankind the Divine plan for true Christian peace, of prayer, penance, and consecration, grant an abundance of grace, strength, and guidance to the members of Thy Fatima Crusade, here present and throughout the world. 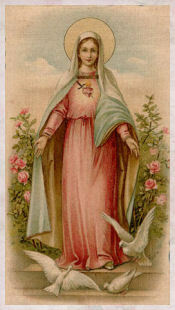 Inspire us to great zeal, oh great Mediatrix of All Graces, that we may be effective instruments in spreading devotion to Thy Rosary; that we may be faithful in wearing Thy scapular; that we may inspire our brothers in Christ to a life of sacrifice, penance, and modesty, and finally, that we may help to bring about that wonderful day when all men, through consecration to Thy Immaculate Heart, shall be one in Christ. Amen. To banish war and fear. Today we will be going on a pilgrimage to the World Apostolate of Fatima's Blue Army Shrine, to join in celebrating our Lady's feast day. I will be praying for all of you. Note: Christopher West recently gave a Nightline interview which may have cast him in a bad light. He is scheduled to give a series of talks in Hawaii soon. I do not know much about his teachings which are based on Pope John Paul II's Theology of the Body. However, I know many strong Catholics who highly recommend his talks. I also have great admiration for Dr. Alice von Hildebrand and I listen carefully to what she says. you want to send your kids to Steubenville. you want to live in Steubenville. Read the rest here Don't forget to read the comments too. Note: Anything in bold has been added by me. We read in the Scriptures how Jesus came to proclaim the Good News that God loves us. He wants us today to be that love. Jesus said: "You did it to me": I was hungry, naked, homeless and lonely and you did it to me. I call this — the Gospel on five fingers. One day, two young people came to our house and they gave me lots of money to feed the people, because in Calcutta, as you know, we have many many poor people whom we feed daily. And I asked them where they got so much money. They said: "Two days ago we got married. Before marriage we decided that we were not going to buy wedding clothes, we were not to have a wedding feast, but that, instead, we would give you the money to feed the poor." It was something extraordinary for Hindu high-class people to do that. I asked them again: "Why did you do that?" and they said: ‘We loved each other so much that we wanted to share the joy of loving with the people you serve." 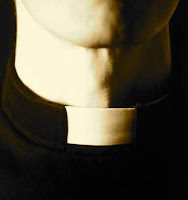 There is no comparison with the vocation of the priest. It is like a replacing of Jesus at the altar, at the confessional, and in all the other sacraments where he uses his own ‘I’, like Jesus. How completely the priest must be one with Jesus for Jesus to use him in his place, in his name, to utter his words, do his actions, take away the sins, and make ordinary bread and wine into the Living Bread of his own body and Blood. 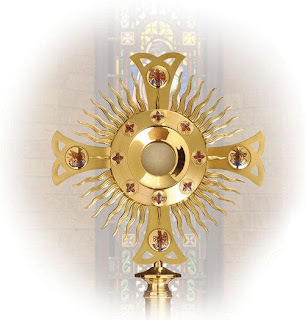 Only in the silence of his heart can he hear God’s word and from the fullness of his heart can he utter these words: "I absolve you" and "This is my body". How pure the mouth of the priest must be and how clean the heart of a priest must be to be able to speak, to utter the words, "This is my body", and to make bread into the living Jesus. 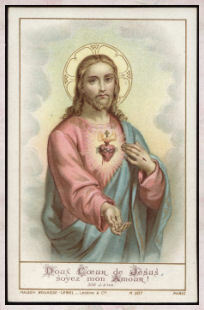 How pure must be the hand of the priest, how completely the hand of Jesus must be the hand of the priest, if in it, when the priest raises that hand, is the precious Blood of Jesus. 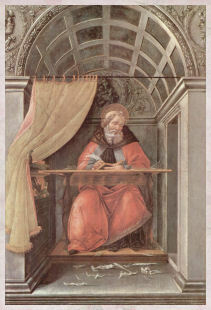 A sinner comes to confession covered with sin, and leaves the confessional, a sinner without sin. 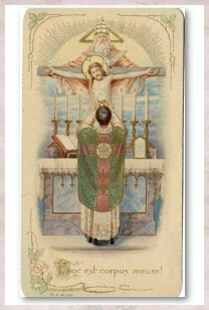 O how pure, how sacred a priest must be to lift away sin and to utter the words, "I absolve you." The sisters found a man and did everything possible for him that love could do for a man who has been shut in like that for years. He did not speak for two days. On the second day, he told the sisters, "You have brought God in my life, bring Father also." So the sisters went and brought a priest and he made his confession after sixty years. The next morning he died. This is what the priest is — he is the ‘connecting link’ between humanity and God, just as Jesus was — to take away sin. God had come into this man’s life, but that forgiveness for his sin had to come through the priests to make the connection with God total. This was a miracle of grace that came to that man who had been away from Jesus for so many years, and he expressed it ~ "You have brought God into my life, bring Father also." That connecting, that mercy, that washing away of his sins came through the hands of the priest, and the words of the priest. You, as God’s priest are to be his living instrument, and so you must ever give him permission to do with you exactly as he wills for the glory of the Father. The same spirit will invite you to live an ever closer oneness with Jesus — in mind, heart and action — so that all you say and do will be for him, with him and to him. As he is one with the Father, so must you be one with Jesus. As it is with his own priesthood that you have been sealed, so he must be the one to live that priesthood within you. Nothing and nobody must separate you from Jesus, so that you can say with St Paul: "It is no longer I who live, but Christ who lives in me." Christ made himself bread of life to satisfy our hunger for his love, and then he makes himself the hungry one so that we may satisfy his hunger for our love. When St Paul was going to destroy the Christians in Damascus, he was thrown down, and he heard the voice: "Saul, Saul, why dost thou persecute me?" and Paul asked him: "Who art thou, Lord?" Christ did not mention the Christians of Damascus. It is the same thing. "Whatever you do to the least of my brethren, you do it me." If in my name you give a glass of water, you give it to Me. If in my name you receive a child, you receive me. And he has made that a condition also, that at the hour of death we are going to be judged on what we have been and what we have done. He makes himself the hungry one, the naked one, the homeless one, the sick one, the lonely one, the unwanted one, the rejected one, and he says: "I was hungry and you gave me to eat." Not only for bread, I was hungry for love. I was naked, not only for a piece of cloth, but I was naked for that human dignity of a child of God. I was homeless, not only for a home made of bricks, but I was homeless, rejected, unwanted, unloved, a throw-away of society, and you did it to me. 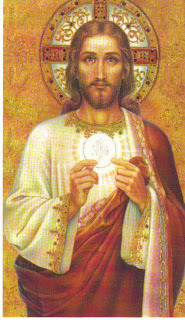 Jesus in the Eucharist made himself bread of life to satisfy our hunger for God, for we have all been created to love and to be loved. And it is very clear what Jesus meant, because how do we love God? Where is God? God is everywhere. How do we love God? And therefore, he gives us the opportunity to do to others what we would like to do to him. To put our love for him in a living action. So, therefore, every priestly vocation is not just to do this or to do that; a priest has been created to belong totally — body, soul, mind, heart, every fibre of his body, every fibre of his soul — to God because he has called him by his name. A priest is very precious to him, a priest is very tenderly loved by God, by Jesus who has chosen him to be his ‘second self. 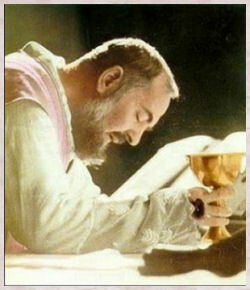 And the work that the priest has been entrusted to do is only a means to put his tender love for God in living action. And therefore, the work that he does is sacred. And the work must always lead not only himself to God, but must be able to lead souls to God. That is why Jesus said: "Let them see your good work and glorify the Father." You are to be a radiance of Jesus himself. Your look must be his, your words his words. The people are not seeking your talents, but God in you. Draw them to God, but never to self. If you are not drawing them to God then you are seeking yourself, and people will love you for yourself, not because you remind them of Jesus. Your desire must be to "give only Jesus" in your ministry, rather than self. Remember that it is only your communion with Jesus that brings about communication of Jesus. As Jesus was so united to the Father as to be his splendour and image, so by your union with Jesus, you become his radiance, a transparency of Christ, so that those who have seen you have in some way seen him. When our Holy Father Paul VI died, I received a trunk call from London asking me what I thought of the death of the Holy Father, and I said: "He was holy, he was a loving father. He had a great love for children and the poor and a special love for the Missionaries of Charity. He has gone home to God and now we can pray to him." 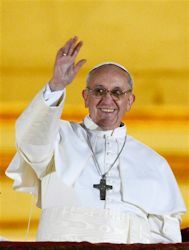 Holy Father did not discuss or explain but expressed one short clear sentence: "I am only living my Mass." Mary, Mother of priests: Contemplate Our Blessed Lady, the Mother of Jesus standing at the foot of the cross of her Son, our only High Priest — with St John the beloved apostle and priest close by her, to whom Jesus said: "Woman, behold your son" and "Son, behold your mother." No one could have been a better priest than the Virgin Mother of God, because she really could without difficulty say: "This is my body... 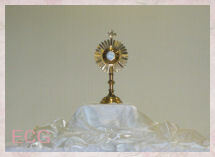 This is my blood" — for it was really and truly her body and blood that she gave to Jesus. 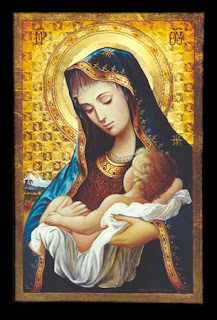 And yet she remained only the handmaid of the Lord, so that you and I may always turn to her as our Mother. And she is one of our own, so that we can always claim her, turn to her and be one with her. And of course, that is why she was left behind — to establish the Church, to strengthen the priesthood of the apostles, to be a mother to them, until the Church, the young Church was formed. She was there. For just as she helped Jesus to grow, so she also helped the Church to grow in the beginning. She was left behind for so many years after Jesus ascended to heaven, so that she was the one who helped to form the Church. She is the one who helps to form every priest; and no one can have a greater claim on Our Lady than a priest. And I can imagine she must have had, and she still has, a very tender love and special protection also for every priest, if he only turns to her. We are busy; we have no spare time. But we have to be fools and spend the time, and then we get back wisdom; and what wisdom there is from communing with the Eucharistic Lord. We are captives, captives of his love, captives of his duty. Kindliness to the unlovable people, the projection of the Spirit of Christ to those who would be unforgiving, all this is foolishness. But if we keep up this holy hour, you will be very thankful in your hearts, not just to me, but that the Lord was so good to you. 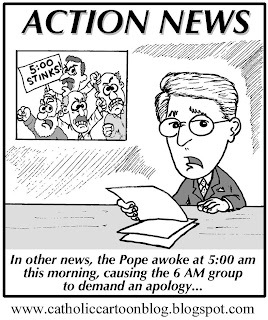 Note: Archbishop Sheen made a Holy Hour every day. He was never too busy for quality time with our Savior. - Through the Year with Fulton Sheen. Compiled by Henry Dieterich. What Should Our Appropriate Response Be? 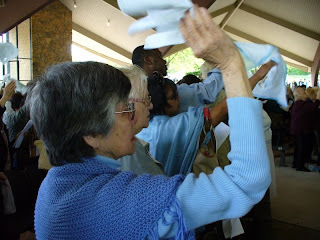 "You envy the opportunity of the woman who touched the vestments of Jesus, of the sinful woman who washed His feet with her treas, of the women of Galilee who had the happiness of following Him in His pilgrimages, of the Apostles and disciples who conversed with Him familiarly, of the people of the time who listened to the words of grace and salvation which came forth from His lips. St. Alphonsus de Liguori on St. John Vianney: "The holy Cure of Ars could not finish repeating these three words without shedding tears. Apostolic Signatura Prefect, Archbishop Raymond Burke has described the University of Notre Dame's conferral of an honorary doctorate on President Barack Obama as "a scandal". We praise you, the Source of all we have, and are! people of Kalawao and Kalaupapa, on the island of Molokai. On this beautiful day, we honor him as we honor you! your infinite love has given us. Help us to love you with all our heart. For yo have said, "love one another as I have loved you!" ke kumu no na mea a pau i loa'a ia makou! maika'i, ho'onami makou ia ia e like me ko makou ho'onani 'ana ia oe! aloha aku ia oe me ko makou pu'uwai a pau. e like me a'u i aloha aku ai ia 'oukou!" Ke noi aku nei makou i keia mau mea ma o ko makou Haku o Iesu Kristo. English and Hawaiian Prayer by Fr. 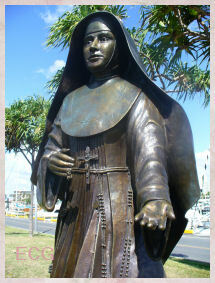 Christopher Keahi, SS.CC., Superior of the Hawaii Province of the Congregation of the Sacred Hearts. 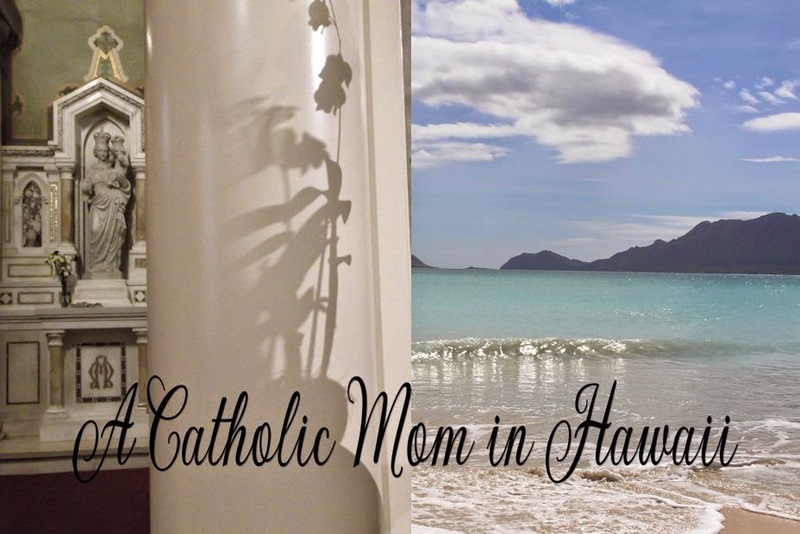 Note: Mahalo to Fr. 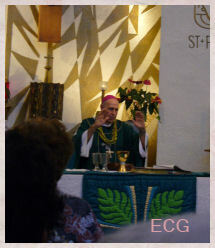 Emilio Vega Garcia, SS.CC and former vice-postulator for Bl. Damien's Cause for posting a comment reminding me today was Fr. 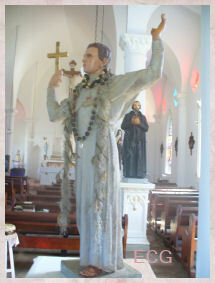 Damien's feast day!! How could I forget. 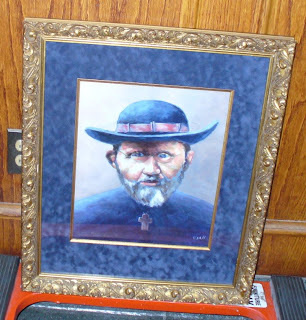 This painting of Father Damien was given as a gift to Fr. Patrick, the Pastor of Blessed Sacrament Church in Paterson, New Jersey. The painting now has a prominent place on the wall as you enter the Church. The most important person on earth is a mother. She can not claim the honor of having built Notre Dame Cathedral. She need not. She has built something more magnificent that any cathedral-- a dwelling for an immortal soul, the tiny perfection of her baby's body. "The angels have not been blessed with such a grace. They cannot share in God's Creative miracle to bring new saints to Heaven. Only a human mother can. Mothers are closer to God the Creator than any other creatures. God joins forces with mothers in performing this act of creation."